For other people named Danny Murphy, see Danny Murphy (disambiguation). Daniel Ben "Danny" Murphy (born 18 March 1977) is an English former footballer who played as a central midfielder. Having begun his career at Crewe Alexandra in 1993, he moved to Liverpool in 1997, where he won a treble of the League Cup, FA Cup and UEFA Cup in 2001. During his time at Liverpool he scored the winning goal against Manchester United at Old Trafford three times, each a 1-0 win. After brief spells at Charlton Athletic and Tottenham Hotspur he joined Fulham, whom he helped reach the 2010 UEFA Europa League Final, and ended his career at Blackburn Rovers. He served as captain at his last two clubs. Murphy made nine appearances for the England team from his debut in 2001, scoring once. Since retiring, he has been a regular analyst on the BBC programme Match of the Day. He took me from boy to man. He taught me about tactics, where to stand, how to play the right way and he knocked some discipline into me. I was a bit precocious, a bit silly as a kid and he straightened me out. In November 2016, as the English football sexual abuse scandal erupted, Murphy also strongly defended Gradi's reputation. Gradi always rated the footballing brain of Murphy, and used to send him on scouting missions even as a trainee. Murphy scored on his debut for Crewe, coming off the bench as a 16-year-old to score the winner in a 4–3 win against Preston North End. Murphy generally played as a deep-lying forward for Crewe, scoring several spectacular long range and set piece goals. While at Gresty Road, Murphy formed a prolific partnership with striker Dele Adebola. Many top flight clubs had their eye on Murphy before his eventual move to Liverpool. Before he left, he helped Crewe reach the second tier of English football for the first time since 1896, as Crewe finished third in Division Two, before going on to defeat Brentford 1–0 at Wembley in the 1997 play-off final. After signing for his boyhood club Liverpool in 1997, for an initial fee of £1.5 million, he made his debut as a substitute on the opening day of the 1997–98 season in a draw with Wimbledon. However, he did not break into the first team squad immediately and, after making just one league appearance for the club during the following season, he returned to Crewe for a successful period on loan, during which he helped save his old club from relegation. After the loan period ended, he looked set to be sold but he went on to become a first-team regular at Anfield. 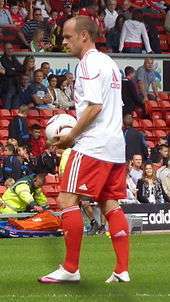 Though naturally a central midfield player, Murphy often played as a wide midfielder due to the fierce competition for places, most notably from Steven Gerrard and Dietmar Hamann. Murphy's career at Liverpool included a unique cup treble in 2001 (where Liverpool won the League Cup, FA Cup and UEFA Cup), a Premier League second-place finish in 2002 and a second League Cup in 2003. During the 2001–02 season, when he established himself as a key member of the side, Liverpool's assistant manager Phil Thompson praised Murphy, citing his versatility and describing him as 'probably the most tactically aware player that we have.' Although the 2002–03 season was overall a disappointing one for Liverpool, with the club slumping to fifth in the table after a lengthy winless run in mid-winter, Murphy had a fine individual campaign which saw him score 12 goals and be voted the supporters' player of the season. He developed an uncanny habit of scoring the deciding goal in 1–0 wins against Manchester United at Old Trafford, a feat he achieved three times in four seasons (2000–01, 2001–02 and 2003–04). Murphy signed for Charlton Athletic from Liverpool for £2.5 million on a four-year contract in August 2004. In his first season at Charlton, Murphy struggled to recapture the form that he had shown at Liverpool. However, in the first three months of the 2005–06 season he emerged as a viable option for England once more, and also won the September player of the month award, scoring several goals along the way. On 31 January 2006, Murphy was transferred to Tottenham Hotspur for £2 million. He appeared only fleetingly in the remaining games of the season. Murphy scored his first Tottenham goal in the 2–1 defeat of Portsmouth on 1 October 2006 after only 39 seconds of the game. He scored his second goal for Tottenham when Jermain Defoe was injured in a pre-match warm-up against Newcastle United; manager Martin Jol brought Murphy into a 4–5–1 formation. Murphy scored with a scissors kick which hit Steven Taylor in the face, deflecting it past goalkeeper Shay Given. After several months, the FA decided to take the goal away from Murphy and put it down as an own-goal for Taylor. Murphy was unable to establish himself as a regular at Tottenham, but made clear later that despite reports in the media, there was no disagreement between him and Jol. Fulham took over Murphy's Tottenham contract on 31 August 2007. Murphy cemented himself as a regular starter, kept his place in the team throughout the season and scored six goals in 43 matches. One goal, a rare header scored on 11 May 2008, gave Fulham a 1–0 win away at Portsmouth and ensured their Premier League survival at the expense of Birmingham City and Reading; the goal was scored as manager Roy Hodgson prepared to substitute Murphy. Following the match, Murphy highlighted Hodgson's "key role" in the team's avoiding relegation. Murphy signed a new one-year contract, with an option for a further year, at the end of the season, and was appointed club captain for 2008–09. 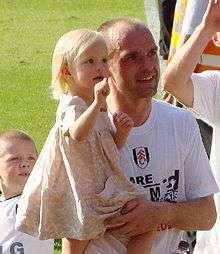 On 9 November 2008, Murphy scored his 100th goal at club level from the penalty spot, as Fulham beat Newcastle United 2–1. Murphy scored another penalty as, for the first time in 45 years, Fulham beat title-chasing Manchester United at home. Murphy converts a penalty kick against Aston Villa on 9 May 2009. The year's option on Murphy's contract was taken up during the season, but in August 2009, amid reported interest from clubs including Birmingham City and Stoke City, he signed another extension, until June 2011. Murphy missed two months in the early part of the season with a knee ligament problem, but went on to captain Fulham to their first European final. They eliminated opponents including Juventus, defending champions Shakhtar Donetsk, Bundesliga champions Wolfsburg, and Hamburg to reach the 2010 UEFA Europa League Final. Ahead of the semifinal, Murphy said that just reaching the final "would be one of the greatest achievements of our history". Fulham lost 2–1 to Atlético Madrid to a goal scored just four minutes from the end of extra time. The 2010–11 season started without Hodgson, who left for Liverpool, and was replaced by Mark Hughes. In October, Murphy made a controversial comment about managers responsible for dangerous tackles made by players. His comment was supported by some, but received heavy criticisms from other managers. In response to these criticisms, Murphy said his comments "were blown out of all proportion". In late-January 2011, Murphy signed another contract extension that will extend until 2012. Just one day after signing a new contract, Murphy scored his first goal of the season and then another, as Fulham beat his former club Tottenham 4–0 in the fourth round of the FA Cup. Murphy was praised by Manager Mark Hughes for helping the club turn things around and avoid relegation. Ahead of the 2011–12 season, Murphy believed he could play a major role and declared himself "fitter than ever". After making forty-nine appearance and scoring seven times in all competitions, he was released by Fulham at the end of the 2011–12 season as he and Martin Jol, who had replaced Hodgson's successor, Hughes, could not agree on a contract extension. In his last season at Craven Cottage, Murphy created more goalscoring chances than any other player in the top-flight. On 25 June 2012, Blackburn Rovers confirmed the signing of Murphy on a two-year contract. He was unveiled on 2 July 2012, wearing the same number 13 squad number that he wore throughout his career, therefore also taking Mark Bunn's number. Murphy cited moving to Blackburn Rovers was for first team football and believes it was the right time to leave Fulham after learning that there will be changes at Fulham. He scored his first goal for Blackburn in a 2–2 draw with Huddersfield Town on 6 November 2012. His second goal came in the FA Cup against Bristol City on 5 January 2013. In March 2013, Murphy was succeeded as Blackburn captain by Scott Dann. On 1 July 2013, Murphy had his contract terminated by mutual consent despite willing to stay at the club for another season. While at the club, Murphy was praised by manager Gary Bowyer for his assistance during Bowyer's management career at Blackburn Rovers. Murphy was capped nine times for England and scored one goal. He made his debut in a friendly match against Sweden in November 2001, and scored his only international goal in a 4–0 victory over Paraguay in April 2002. Having been called up as a replacement for injured club team-mate Steven Gerrard, he was set to play at the 2002 World Cup, but had to withdraw from the squad after he suffered a metatarsal injury similar to that which had affected England team mates David Beckham and Gary Neville in the run-up to the tournament. On 18 August 2013, Murphy appeared as a new pundit on the BBC show Match of the Day. He announced his retirement as a player on 10 October 2013, with the intention of continuing his media work and completing his coaching badges. Murphy is married to actress Joanna Taylor, whom he met through a mutual friend, actor Louis Emerick. As of May 2008, Murphy and Taylor had a daughter, Mya, and Murphy had a son from a previous relationship. In 2015 Danny qualified as a physiotherapist, following a desire to remain in the sporting industry. 2011–12 appearances includes match in UEFA Cup, away to Dnipro on 25 August 2011, which is currently not included on Soccerbase website. ↑ "List of Players under Written Contract Whose Registrations have been Cancelled by Mutual Consent Between 01/06/2013 and 30/06/2013". The Football Association. Retrieved 24 November 2014. ↑ "Danny Murphy". ESPN FC. Retrieved 3 July 2013. ↑ "History of LFC - 2001 to present". Liverpool FC. Retrieved 7 March 2014. 1 2 "Man Utd 0–1 Liverpool". BBC Sport. 24 April 2004. Retrieved 9 January 2011. 1 2 "DANNY MURPHY: Being paid to talk about football is good fun ... but I'm not ready to retire while I believe I can still play in the Premier League". Mail Online. 4 October 2013. Retrieved 27 April 2014. ↑ Wallace, Sam (27 February 2002). "Murphy stakes his World Cup claim". The Daily Telegraph. London. ↑ P@maN (7 March 2008). "Liverpool Football Club : Past Players Profile: Danny Murphy". Lfcstory.blogspot.co.uk. Retrieved 7 March 2014. ↑ "Liverpool break United home rule". BBC Sport. 17 December 2000. Retrieved 9 January 2011. ↑ "Liverpool stun Man Utd". BBC Sport. 22 January 2002. Retrieved 9 January 2011. ↑ "Charlton secure Murphy deal". BBC Sport. 10 August 2004. Retrieved 26 May 2007. ↑ "Tottenham clinch late Murphy deal". BBC Sport. 31 January 2006. Retrieved 26 May 2007. ↑ Lyon, Sam (1 October 2006). "Tottenham 2–1 Portsmouth". BBC Sport. Retrieved 26 October 2009. ↑ Fletcher, Paul (23 December 2006). "Newcastle 3–1 Tottenham". BBC Sport. Retrieved 26 October 2009. ↑ "Murphy denies Jol fall-out". Sky Sports. 3 July 2011. Retrieved 18 April 2014. ↑ "Murphy keen on new deal". Sky Sports. 13 November 2007. Retrieved 27 April 2014. ↑ Hughes, Ian (11 May 2008). "Portsmouth 0-1 Fulham". BBC Sport. Retrieved 27 April 2014. ↑ Pearson, James (12 May 2008). "Murphy hails Hodgson". Sky Sports. Retrieved 27 April 2014. ↑ Rutledge, Lewis (13 June 2008). "Murphy pens Fulham deal". Sky Sports. Retrieved 27 April 2014. ↑ "Captain's honour". Fulham FC. 14 August 2008. Retrieved 27 April 2014. ↑ "Match Report: Murphy spot-on for Fulham". Sky Sports. 10 November 2008. Retrieved 27 April 2014. ↑ Cheese, Caroline (21 March 2009). "Fulham 2–0 Man Utd". BBC Sport. Retrieved 27 April 2014. ↑ Ball, Elliot (2 February 2009). "Murphy signs new Fulham deal". Fulham FC. Retrieved 27 April 2014. ↑ "Pulis plays down Murphy talk". Sky Sports. 28 July 2009. Retrieved 18 April 2014. ↑ "Murphy signs extension". Fulham FC. 24 August 2009. Retrieved 27 April 2014. ↑ "Murphy and Johnson in contention". Sky Sports. 23 November 2009. Retrieved 27 April 2014. ↑ "No Euro fear factor for Murphy". Sky Sports. 28 April 2010. Retrieved 18 April 2014. ↑ McCarra, Kevin (12 May 2010). "Atlético Madrid's Diego Forlán strikes to beat Fulham in Europa League". The Guardian. Retrieved 27 April 2014. ↑ "Murphy blames the bosses". Sky Sports. 10 October 2010. Retrieved 18 April 2014. ↑ "Dario Gradi backs Danny Murphy tackle criticism". BBC Sport. 14 October 2010. Retrieved 18 April 2014. ↑ "Allardyce, Pulis & McCarthy dismiss Danny Murphy claims". BBC Sport. 15 October 2010. Retrieved 18 April 2014. ↑ "Murphy plays down row". Sky Sports. 16 October 2010. Retrieved 18 April 2014. ↑ "Murphy pens new Fulham deal". Sky Sports. 29 January 2011. Retrieved 18 April 2014. ↑ "Fulham 4-0 Tottenham". BBC Sport. 30 January 2011. Retrieved 18 April 2014. ↑ "Murphy earns Hughes praise". Sky Sports. 6 February 2011. Retrieved 18 April 2014. ↑ "Murphy - I'm fitter than ever". Sky Sports. 1 August 2011. Retrieved 18 April 2014. ↑ "Blackburn complete Danny Murphy signing". Goal.com. 25 June 2012. Retrieved 7 March 2014. ↑ "Danny Murphy signs for Blackburn on two-year deal". ESPN FC. 25 June 2012. Retrieved 7 March 2014. ↑ "Danny Murphy signs for Blackburn Rovers". Blackburn Rovers FC. Retrieved 27 November 2013. ↑ "Danny Murphy 'promised regular football' by Blackburn Rovers". BBC Sport. 2 July 2012. Retrieved 18 April 2014. ↑ "Huddersfield 2-2 Blackburn". BBC Sport. 6 November 2012. Retrieved 5 January 2013. ↑ "Blackburn 2-0 Bristol City". BBC Sport. 5 January 2013. Retrieved 5 January 2013. ↑ "Scott Dann is the new captain of Blackburn replacing Danny Murphy". Sky Sports. 12 March 2013. Retrieved 12 March 2013. ↑ "Danny Murphy and Blackburn Rovers agree midfielder's release". BBC Sport. 1 July 2013. Retrieved 2 July 2013. ↑ "Transfer news: Danny Murphy content to stay at Blackburn for next season". Sky Sports. 26 April 2013. Retrieved 18 April 2014. ↑ "Blackburn: Gary Bowyer grateful for Danny Murphy advice". BBC Sport. 8 January 2013. Retrieved 18 April 2014. ↑ Lineker, Gary (16 August 2013). "BBC Sport - Match of the Day returns with 50th year of top-flight coverage". bbc.co.uk. Retrieved 7 March 2014. ↑ Cruise, Ian (10 October 2013). "Exclusive – Murphy announces his retirement from football". Talksport. Retrieved 10 October 2013. ↑ "My Danny played a blinder ... as a loving dad and husband". The Sun. 12 May 2008. Retrieved 12 May 2008. ↑ "Danny Murphy Career Stats". Soccerbase. 4 January 2011. Retrieved 4 January 2011. Wikimedia Commons has media related to Danny Murphy (footballer born 1977).